For the past 18 years, Dr. Hackett has enjoyed a reputable career in higher education, from college counseling and student services as an academic advisor, program coordinator, consultant, lecturer and athletic counseling faculty. 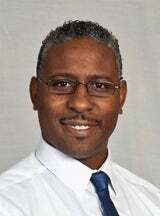 He is currently an Assistant Professor in the department of Africana Studies at California State University, Northridge and the director of the DuBois-Hamer Institute for Academic Achievement. He also works for the athletic department as a Counseling Faculty member at Santa Monica Community College. Dr. Hackett received his Doctor of Education degree in Higher Education Leadership at California Lutheran University in 2011. He was a recipient of the prestigious Chancellor’s Doctoral Incentive Program designed to assist students who are interested in teaching in the CSU. His research interests are broad, spanning from leadership, identity development, athletics and student development & engagement, as well as the psychological and sociological nature of underrepresented groups (i.e. experiences of Black Men in higher education). Dr. Hackett is the founder and former coordinator of the CSUN Advancement to Graduate Education (AGE) initiative from 1999-2006. In 2006 the program transitioned to the Office of Graduate Studies. He also coordinated the 18th Annual Statewide CSU Research Competition in 2004 hosted by the CSUN Office of Graduate Studies. Dr. Hackett has provided service as a member of National Association of Student Personnel Administrators since fall of 1996. He is the former National chair of the NASPA African American Knowledge Community (AAKC), former Region VI Chair of the AAKC, former liaison and mentor for the NASPA Region VI Minority Undergraduate Fellows Program (MUFP) from 2002-2004. Dr. Hackett served as the Web Coordinator for the NASPA Region VI Conference Planning Team in 2005 in Tucson, Arizona. He served on the NASPA Region VI Advisory Board as the Knowledge Community Coordinator from 2006-2008. He also served on the 2008 NASPA Region VI Conference Planning Committee as the Program Chair. He also served as a member of the Southern California Professional Development committee from1999-2001. Dr, Hackett was recognized as a recipient of the Dorothy Keller New Professional Award in 2000, the recipient of the Mid-Level Professional Award in 2006, and the 2008 recipient of the National Mid-Level Professional Award. Currently, Dr. Hackett serves on the NASPA Region VI Advisory Board as a Research representative for NASPA Region VI. Dr. Hackett enjoys volunteering his efforts with coaching basketball and flag football for the Northridge Recreation Center (NRC) since 2001 and the North Valley YMCA. He was named the Play Leader of the Year 2004 for Northridge Park Recreation Center. He has coached 10 NRC All Star flag football teams and was the recipient of the West Valley Regional title for the 12-13 age division in 2005, 2007, 2013, and 2014.